Choosing a cemetery plot can be just as much fun, and just as confusing, as buying any other real estate asset. The biggest difference is that usually when you are shopping for real estate it is for a house, a vacation home, or an investment that you will enjoy or reap benefits from while you are alive. However, chances are that your purchases are also part of your total estate planning. If that is the case, then you may also be thinking about your loved ones and heirs when you pass on. In that way buying a final resting place is actually quite similar to other real estate transactions, assuming that you are buying prior to the stress and emotion that comes at the actual time of need. What Drives the Cemetery Choice? When buying a plot, most people act on one of two impulses. They either go with tradition or personal preference. Tradition is typically driven by religion and/or family history. Tradition almost preordains where you will be buried, right down to the last detail of the plot location. However, even if you are bound by tradition, you may still have a few choices you need to make such as whether you will be buried in a single, side by side, or double-depth (where literally two people can be buried in one grave). In the situation with double-depth burial, individual cemetery rules and regulations will usually govern this. Typically, cemetery rules and regulations will also govern what type of memorialization is permitted. 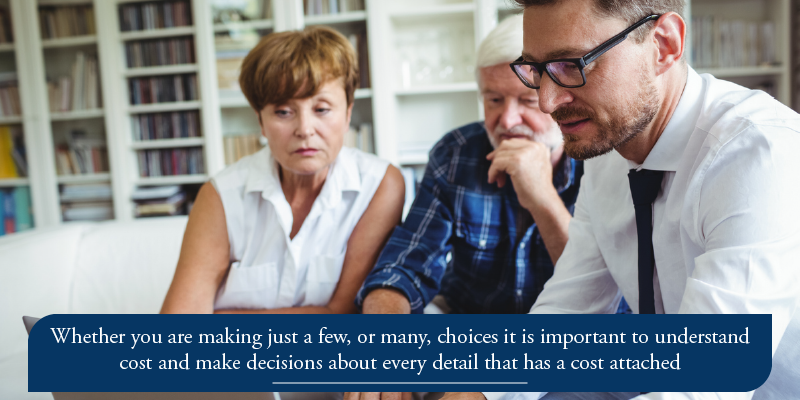 Whether you are making just a few, or many choices, it is important to understand cost and make decisions about every detail that has a cost attached, including the fees and options for perpetual care, if applicable. More on personal preference follows. There are only three scenarios in which there is no cost associated with burial. The first is one in which every detail was taken care of prior to need by either someone else or because you have an investment or insurance policy. Presumably if you are shopping for a burial site then you are in this process so at the time of death, your loved ones will not have to worry about the financial burden, which is the best reason to have a good burial insurance policy. The second is if you are veteran. All veterans are entitled to a no cost funeral and burial at a government-managed cemetery. Veterans can choose to be buried at the cemetery of their choice and will receive an amount towards those costs. The third scenario is one in which a person passes away and they are indigent. In this case, in some places, there are public alternatives available. Short of this, almost everything else is left to personal preference, which is where the fun comes in. Most people shop for the prettiest, cheapest, most convenient place they can find. This is likely to be your approach as well. Sorting through the different types of cemeteries is usually not that difficult. There are public, religious, private, district or municipal, and national or veteran. Only veterans, active duty, and their immediate families can be buried in veterans’, or national, cemeteries. Municipal are typically reserved for the indigent. For most other people, this leaves the choice of public, religious or private and then the choices of site, location, interment style, memorial and perpetual care. In order to sort through this the Funeral Consumers Alliance (a national consumer organization that monitors the funeral industry) strongly recommends that you get a printed and itemized list of all costs and a copy of the cemetery’s rules and regulations. This will help you know what you are and are not buying and help you make smart choices so that your preferences and choices can in fact be accomodated. CMS Mid-Atlantic can help guide those choices with a sophisticated set of tools and a portfolio of cemetery options to explore. There are a few things that are significant to understand as the consumer. One is that while the FTC regulates the funeral industry, its oversight does not extend to cemeteries. 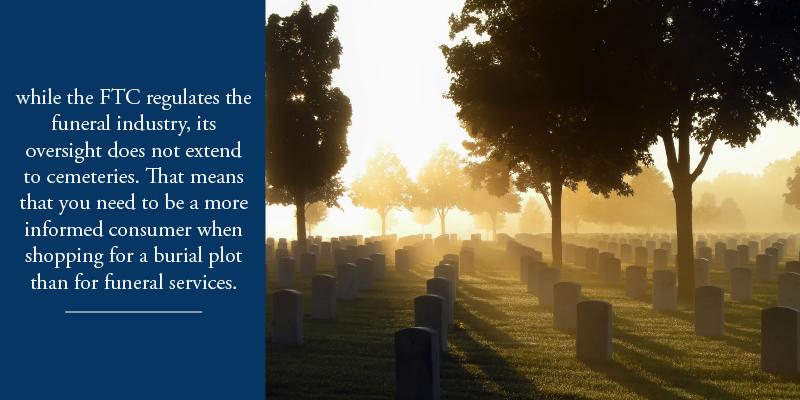 That means that you need to be a more informed consumer when shopping for a burial plot than for funeral services. Another is that funeral and burial costs are, generally speaking, entirely separate and each can reach $10,000 or greater fairly quickly with the costs continuing to rise. This means that purchasing now can save you and your loved ones a significant amount of money. One way to do this is by financing a plot. Some cemeteries do their own financing and many third party companies and banks provide this service. The advantage of this is that you are locking in a lower price now and spreading that cost out over time. The disadvantage would kick in if you pass away before you expect to, triggering a balloon-type payment that your estate or a loved one will have to pick up. 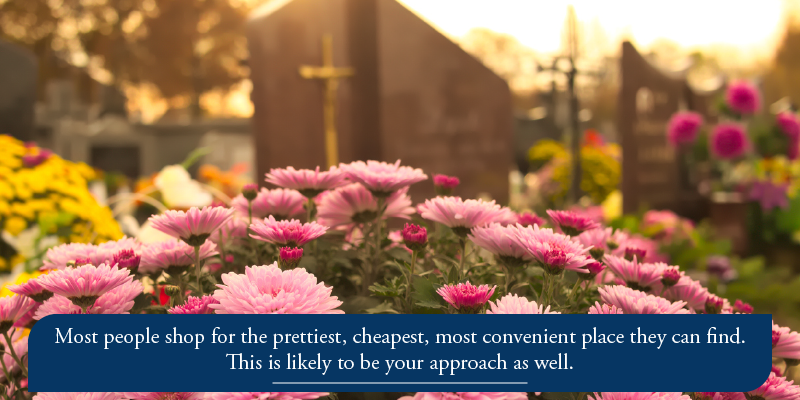 You don’t have to commit, but you might as well start shopping for burial plots today to make sure that you have every opportunity and choice available to you. This entry was posted in Uncategorized and tagged Cemetery Plot. Bookmark the permalink.